Fed Chair Jerome Powell told reporters after the Fed announced it raised rates for the third time this year he does not see inflation surprising to the upside, noting: "It's not in our forecasts." The comments sent interest rates and bank shares lower and dragged the broader indexes down with them. Stocks closed lower on Wednesday, giving up earlier gains, as comments from Federal Reserve Chairman Jerome Powell following a monetary policy announcement sent interest rates lower and bank stocks along with them. The Dow Jones Industrial Average fell 106.93 points to 26,385.28, while the S&P 500 declined 0.3 percent to 2,905.97. The Nasdaq Composite fell 0.2 percent to 7,990.37. Powell told reporters after the Fed announced it raised rates for the third time this year he does not see inflation surprising to the upside, noting: "It's not in our forecasts." The comment sent rates lower, along with bank stocks. The 10-year Treasury note yield fell to 3.06 percent. Shares of J.P. Morgan Chase, Bank of America and Citigroup all dropped more than 1 percent. The SPDR S&P Bank ETF (KBE) dropped 2 percent. Earlier on Wednesday, Fed officials upped their outlook for U.S. economic growth this year and next. They now expect the U.S. economy to grow by 3.1 percent in 2018, up from 2.8 percent. They also see the economy expanding 2.5 percent in 2019, up from 2.4 percent. The Fed also raised its target overnight rate to a range of 2 percent to 2.25 percent, up from 1.75 percent to 2 percent. This marks the central bank's eighth rate hike since 2015. The central bank dropped the word "accommodative" from its statement in how it describes its monetary policy. Some traders took this to mean that if the Fed no longer believes its policy is accomodative, it's likely closer to being done with its rate hikes. Equities hit their session highs after the Fed's announcement but later pulled back as Powell answered questions. 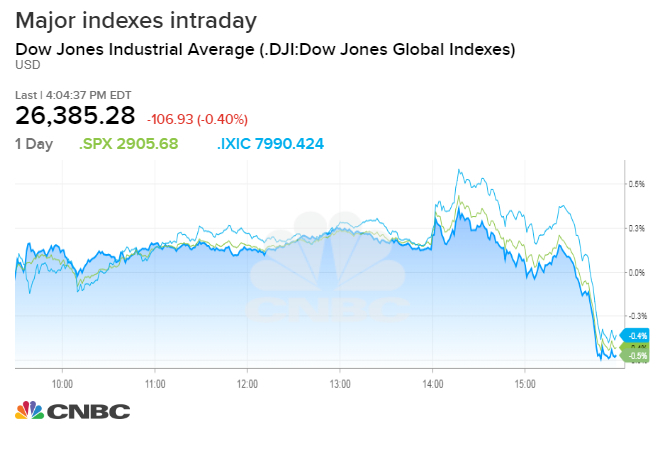 The Dow rose as much as 113.88 points, while the S&P 500 and Nasdaq gained as much as 0.5 percent and 0.7 percent, respectively. Michael Arone, chief investment strategist at State Street Global Advisors, said the market first interpreted the word's removal as "the end of the Fed tightening cycle." However, Powell said the removal of that word does not signal any change in the bank's path toward normalizing monetary policy. "I think as much the Fed and Powell, in particular, don't want the market to interpret the removal of 'accommodative' as a signal that they're near the end," said Arone. Wednesday's Fed decision comes after stocks closed lower in the previous session as renewed worries around trade dampened investor sentiment. During a speech to the United Nations General Assembly on Tuesday, President Donald Trump defended his administration's stance on trade, telling international leaders the U.S. would no longer endure "such abuse," but act in its "national interest" when it feels like it's being duped. Trump went on to criticize OPEC and OPEC nations, stating that the group was "ripping off" the rest of the world and taking advantage by delivering high oil prices. The president's comments came after Trade Representative Robert Lighthizer said Tuesday that the United States was prepared to move forward with Mexico on a new NAFTA-style accord — with or without Canada's participation. "Trade is an overhang that suggests the longer term implications are yet to be determined," said Terry Sandven, chief equity strategist at U.S. Bank Wealth Management. Long term, however, the backdrop is still favorable for U.S. equities amid strong economic and earnings growth. Fed Chair Powell told reporters on Wednesday the central bank is hearing a "rising chorus of concerns" from companies about tariffs. IBM shares rose 1.8 percent after analysts at UBS upgraded them to buy from neutral, predicting the company will report better-than-expected earnings next year.